As a prelude I would like to make sure everyone knows I love these little workhorse pens and I'm happy. The review comes across as a bit critical, but I use the same eyes to measure this pen as I would any other one and I am just trying to be thorough, and hopefully helpful to anyone considering getting one. This review is also available at my blog, Spacewater. Click here to read it there. Ok, resume your review now. I truly love an inexpensive little workhorse pen, so you can imagine how excited I was to order two of these New Old Stock German Piston-fillers from the Fountain Pen Network's own Smeden (a.k.a. Peter). Reform is a strange company. You can buy 1745s and P120s by the freight car but finding anything out about their history is tough indeed. 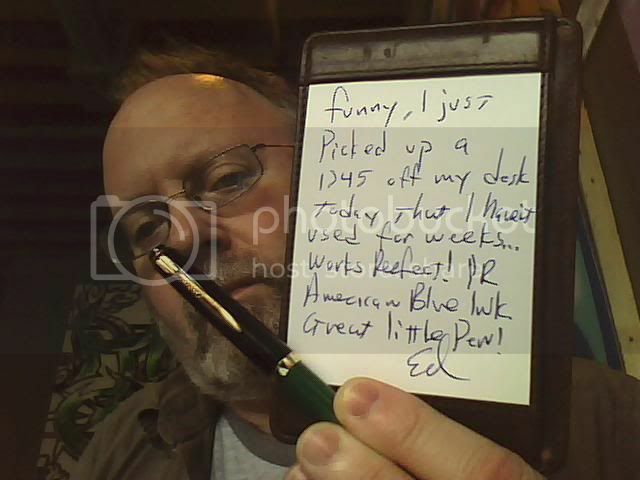 I did find some things out: for anyone interested in the detailed history of Reform, our own Fountain Pen Network user "Kaweco" posted a brief summary just about three years ago in 2007, click here to read his original post and a quote follows. During the second half of the 20th the KAWECO, one of the world`s greatest writing equipment producers in Heidelberg, Germany, immediately went down and Philipp Mutschler and some of his co-workers decided to leave the firm in 1928 to build up their own factory. 1929 the Kaweco actually went to bancrupty and the "Badische Federhalterfabrik Knust, Grube & Woringen" bought the Kaweco trade mark. The first calculation of the new Mutschler works sounded fantastic. They had a small building, similar to a shed, 5 turnery machines, a chasing- and a polishing machine and 10 workers. The first real cash flow was expected after 6 weeks! (Today it sounds like: somebody had invented a money printing machine). But they managed it. 1932 was the worst economic year because the world monetary crisis swapped across the pond, but Mutschler expanded and had to build a new factory hall in 1938. They cooperated with the "Reform" works from Nieder- Ramstadt, which had a daughter firm in Heidelberg. After a fusion they changed their trademark from "Certo" to "Reform" with an "R" with wings. Mutschler was one of th first who used the injection moulding process for FP production and therefore they constructed their own machines. Reform delivered complete writing systems and parts to several other well known firms like Geha, Herlitz, Rotring, AT Cross, Elysee, Dunnhill, Dupont, Cartier, Caran d Ache or Christian Dior. They bought the "DEGUSSA"- and the "RUPP" nib factory and produced excellent nibs. Alas, after all nearly nobody knew "Reform". 1963 Otto and Peter, the sons of Philipp Mutschler took over the firm. 10 years later they went to the large old building which once was a part of the Kaweco factory. But in 1999 they had to leave and to sell the house. Reform, a trade mark with its best reputation, which had produced 10 Million fountainpens per year in the early 90th (4 times as much as Lamy) went down. The rescues of Sanford and Ullrich Mutschler failed and the firm went to bancrupty in the late 2003. The Machines were sold to far east, but the quality of the once produced "Iridium Point Germany" nibs is today only a shadow of the old stuff from Heidelberg. 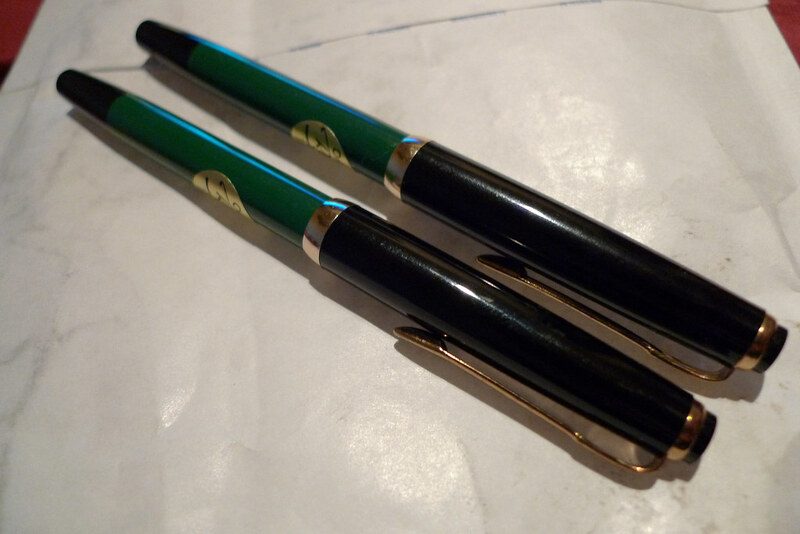 And I am also not sure which of the today sold fountainpens is actually "Reform New old stock"
First glance at these pens was just about what I expected -- green plastic barrels with black plastic cap and section, with two-tone steel nib, size unmarked but most certainly a fine point. Compared to my Pelikan or even my Vanishing Point the first word that comes to mind is definitely "cheap" but I never expected these pens to last a lifetime for this price. The pens came well packaged in a simple envelope from Smeden (a.k.a. Peter) in Finland, wrapped to avoid scratching each other. The pens came to me in pristine condition, truly new old stock. The barrels were shiny and unused, stickers and all, and all the gold-colored plating was unmarred, as were the nibs. The overall fit and finish is very good for pens this inexpensive. I daresay overall a Kaweco Scout is not made nearly as well, notwithstanding manufacturing problems with some of the Reform nibs (see below). The 1745's design is classic Pelikan-style piston filler, with straight lines and a vaguely Pelikan-shaped clip on the very narrow pen. Overall these pens look good, although the plastic is a bit slick in the hands with prolonged writing. For eight dollars you can't expect too much from a pen, and that definitely holds true with the Reform 1745 as well. I originally ordered two Reform 1745s but when they arrived I saw quickly that neither one would write for any significant amount of time. In fact, one of them wouldn't even write when dipped. The short answer reason for this is that the nibs were faulty. Click on the "Nib and Performance" picture below and view the original magnification to see that the nibs were not split down the middle as you might expect. When Peter (FPN's Smeden) found out, he immediately posted me two new pens (that he had obviously tested himself before they left, judging from the water droplets left in the barrels), as well as a bonus Dollar Student Pen for my trouble. Thanks Peter! I eventually ended up with two working pens out of four complete pens sent to me (see below), but other than manufacturing problems with some of the nibs, the fit and finish of the pens is good, all the parts worked smoothly, and everything fit together as it should. I have a bit of a problem sometimes with the posted caps sticking to the blind cap and partially unscrewing the piston, but I soon learned not to post them so hard! Also, the clips tend to unscrew from the end cap as you unscrew them from the barrel or unpost them from the end. Not a huge deal, but I had to get used to grabbing the whole cap to unscrew or unpost it. The pen is 12.95 cm (little over 5 in) capped, and 14.88 cm (5.86 in) posted in length, and the diameter is 1 cm (.390 in) at the body, and .86 cm (.340 in) at the section. It is a small pen, but not uncomfortable to my big hands. The Reform 1745 is a thin pen but not very short. It would be most comfortable in a smaller hand, but this pen is the perfect size for carrying in your organizer or slip in your pocket. Ergonomically, I always feel like I have good control of the pen -- but as I mentioned before the plastic is a bit slippery compared to Ebonite or Celluloid. I have written for extended periods of time with this Reform and I not only enjoy it, I keep coming back to it, even if it is a bit thin. It must be said that the nibs on these N.O.S. Reform 1745s are hit-or-miss. 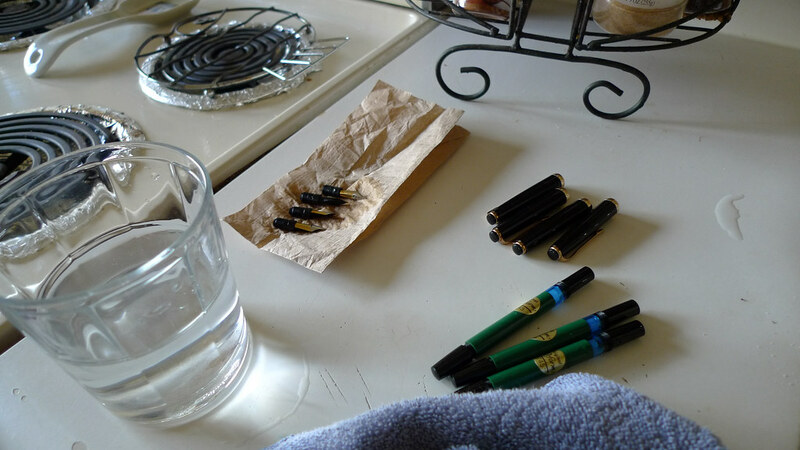 A good long soaking, with the pens completely disassembled goes a long way to improving ink flow, but obviously from my experience it's about a 50/50 proposition. 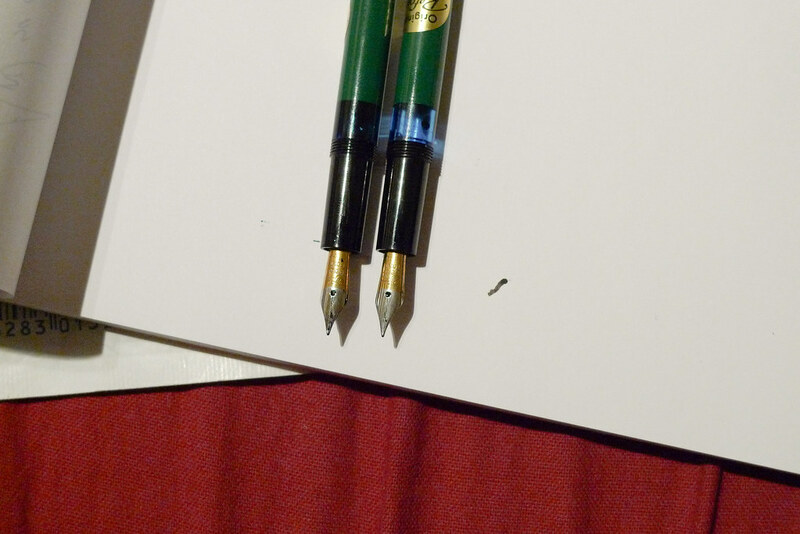 Of the four pens I eventually received, I was able to Frankenstein two complete pens ultimately. A nice side effect of this is that I have extra barrels, caps and clips for these two as they wear out from use. Of the two rescued nibs, my favorite one turned out to write a wet fine, with good flow. The pen glides across the page with the perfect amount of tooth and it's a pleasure to write with. The second nib ended up writing a fairly dry extra-fine line. It's not suitable for long writing sessions but it's absolutely perfect for sketching and fine lettering, and so I'm very happy about it. It should come as no surprise that the tried-and-true German Piston filling system in the Reform 1745 works exactly as promised. Of the four barrels I have, only one of them was a little faulty -- only drawing up half a cylinder of ink at a time -- so I swapped it with one of my spares. I don't have any way to measure the exact ink capacity of these pens, but it is certainly larger than any converter or cartridge. Piston filling pens really deliver when you have to write a lot, and this pen does the job very well. Maintenance on these pens is beyond easy for such an inexpensive instrument. The ability to fully clean your pens as a feature gets swept under the rug sometimes by pen designers, but the Reform 1745's nibs and feeds are fully removeable from the section with a twist a la Pelikan and Esterbrook. It's hard to see anyone letting these get very dirty of clogged. In fact, the ease of disassembling and cleaning these runs at the head of the pack of reason for my delight with the 1745 because that's why I was able to piece together these two examples. Here is another area where these pens really shine like gems. I paid us$8 each for these, and when Peter (again, FPN's own Smeden) found out my first two were duds he immediately posted two replacements to me, free of charge, from Finland. I can't say enough nice things about Peter, but I will say at least his primary concern was making sure I had working pens that I was happy with. Mission accomplished, thanks Peter! If you're reading this review, you're probably considering picking up a couple of these for spares, school, loaners, fun ink colors, or just curiosity. In any case, even with the trouble I had it's hard to argue with the price tag of these well-made, if inconsistent, German piston-fillers. Aside from simply faulty nibs, the only lasting problem I had with these pens was one aenemic plunger, which didn't even interfere with the use of the pen. I would recommend anyone interested pick up several of these. At the prices these go for, they're easily within reach of any curious Fountain Pen user, and for the budget-minded, although it's true that you could spend more and get something 100% reliable out of the box, you will be spending a lot more, not a little more. With a careful initial cleaning and a little luck, you could hardly lay your hands on a more reliable daily writer to toss in your bag. So I give the Reform 1745 a strong buy, but Caveat Emptor, you might have to give it a couple of tries to get one right for you. I welcome your comments and corrections. Thanks. Edited by Juicyjones, 07 April 2010 - 14:58. A fine and detailed write up. Thanks for that. Thanks for the review! I have been thinking about getting one of these. I wondered which nib options are offered. Cheers! Great review. I had no trouble with the Reform pen. It takes a little pre-conditioning to get it to work right. It seems that you have the general concept. The tines may to be opened a bit by using a small shim. I owned three at one point. My biggest complaint is that the pen is too thin. It was a German school pen designed for the hands of small children. On a side note, Lamy's ABC is actually a fat pen, also designed for children. Because the pen is too thin, it started hurting my hand after writing for longer than a few minutes. I felt basically the same -- the thinnness is the hardest thing to cope with ergonomically -- although I write a bit slowly so it doesn't hurt too much. But the best one I was able to recover writes so well it hardly matters. I encourage you to click the link above and zoom all the way into the high-resolution photos of the nibs in question, they're pretty funny -- no amount of soaking can change how the tines are split at the factory unfortunately. Think I got a couple of the buggers for free buying other pens... Nothing not to like about this pen. 2 of my 3 are perfect. cool! Yeah even with my track record I'm still in love with these babies. Hey and PR Am Blue is on my short list to buy, notice I used PR Midnight Blues above quite a bit. Great detailed review - thanks. I will be taking extra care with the new ones. I remember reading on here that the tip of the nib is coated with protective layer of wax - it certainly seemed to have something on it which I had to rub off by writing before the ink started to flow. Does anyone know anything about this or what's the proper way to remove the wax? Pilot: Green, Black 78G (F); Black 78G (Stub). Platignum: Green No. 5 Studio. Great and useful review - really like the cleaning pic! Thank you! P. S. I love the use of 'Frankenstein' as a transitive verb! I'm now going to use it at every opportunity. Yes you got that right when you get these you must clean them before you fill them with ink. I just soak mine in water for a few hours and it seems to work. If you need to be more aggressive you can add a drop of dish soap to a glass of water and flush the pen with that (then clean water), or soak in a 10:1 water / ammonia solution for a while. very nice and honest review of the 1745. thanx. mine was the scratchiest thing you ever saw. but after some tweaking and amoothing it is now a decent writer. Good review!. These pens are really worth trying, incredible value for the money. 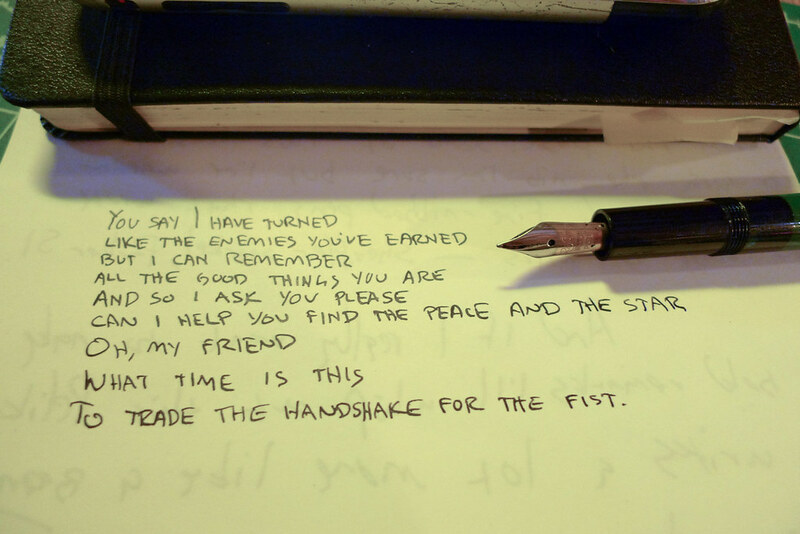 I agree that they are made for long writing sessions and with your remark that may be thin for big hands. Every student should have one, big ink capacity plus a vintage nib that is a pleasure to use. Nice pics, thanks for making the review. Great review. I had problems with my Reform as well, it was scratchy and didn't have a good ink flow. After several flushes and nib adjustments it now writes nice and wet. I love it! I have an even thinner P-120...but I don't have a mike to measure it. But holding it with a P-75, they are the same width. It was NOS and was sort of old, so I had to run it across a brown paper bag two or three times for 15 or so seconds to get rid of the oxidation. It has just a touch of flex in a M. Ie it is not a nail.Not- semi flex or any thing like that, but a good nib in a "cheap" pen. Good thing I like that kid. I needed a pen to sent to the Philippines, to my god child. As a school pen it would be just fine with the hooded nib. Suddenly I was looking at it, first time in my rotation, and . It is a very well made inexpensive pen. It is not a cheap pen, there being a difference in quality. I'll have to see about getting at least his initials monogrammed into it. Good School pens make Bolt look slow, at the speed good ones walk. Seeing I don't pinch this pen but write fore finger up, it's a very good thing I like that kid. When he turns 12 an Esterbrook....how mean of me to hook an innocent kid, like this. Edited by Bo Bo Olson, 30 April 2010 - 20:57. I like to have some pens that are reliable, inexpensive, and not overly large to use outside of the house. The Reform 1745 is an ideal pen for that purpose. I purchased two of them from an FPN member that was selling a bunch of them about a year ago. No problems with them at all. They actually write better than a couple of pens I have that cost fifty times more. Another good pen in the same category is the Lanbitou 866. Of the two, I prefer the Reform 1745 due to the very reliable internal piston feed. But the Lanbitou comes with a converter and is easy to find on Ebay. I think I snagged my last one for under $2 with free shipping. I did a review of the Lanbitou 866 about a year ago. The link is below. Since then I've given some away and purchased a few more. I knew I should have picked up one of these a couple a years ago when they were plentiful. I bought first the P-120, @ € 5 on German Ebay, last year. In that I can't remove the nib, I sucked up some 50-50 glycerine's and water. I let it sit nib up, over night. A minute on the brown paper bag...and it was fine....still is fine. Was a Fine nib. This year, a couple of months ago, I got a double pack of 1745 for € 3. And a P-125, which I expected to be larger. It was larger than the 1745s, it was the same size as the P-120. It was expensive € 10. The 1745s were twist out nibs, the P-125 a friction feed. In both cases, I removed the nib and feed and put in some silicon grease on the edge of piston. 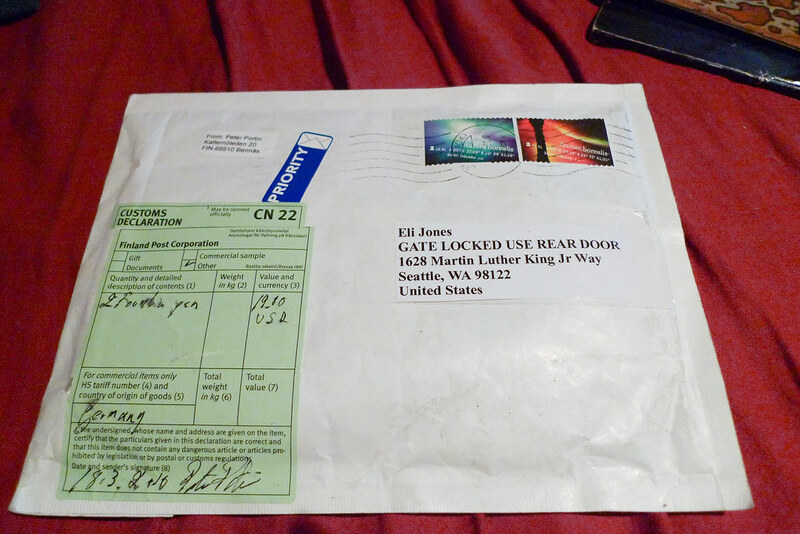 Then I brown paper bagged each for less than a minutes in 15 second, circle left, right, up and down, sideways and figure 8s..
On the P-125 I got an normal flex EF and on the Reform 1745, I got a Fine and a Semi-flex fine. That was pure luck of the draw. I had absolutely no problems with my Reform pens which were not tweaked, but as is. 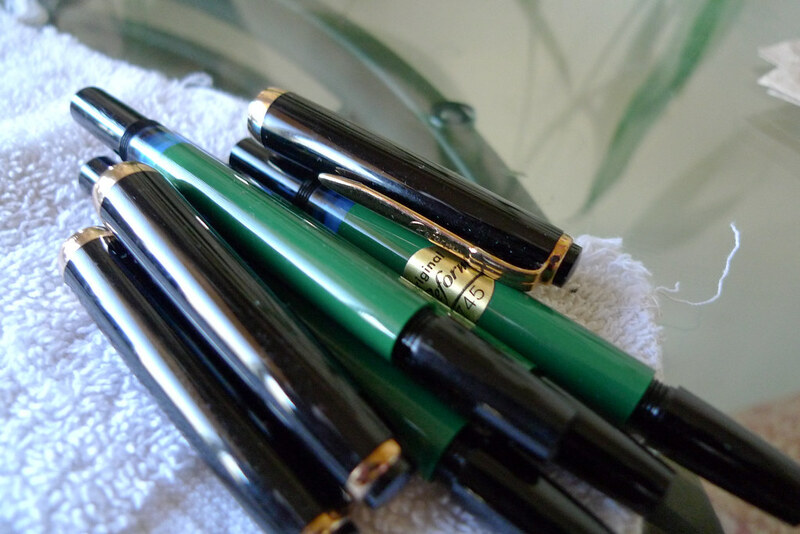 I do not consider a pen that has sat a long time as NOS, that it has to have Glycerin or silicon put in the piston chamber or that it needed some brown paper bag, to remove some micro-corrosion on a long setting nib, a problem. It is only a problem if one might not know what to do. Due to some nice poster, I did know what to do. Edited by Bo Bo Olson, 13 July 2010 - 18:16.